This cookie is very reminiscent of freshly brewed cappuccino. It has the same exquisite, full-bodied flavor. Line two baking sheets with nonstick silicone baking mats or parchment paper. (Alternatively, use nonstick baking sheets or lightly butter conventional baking sheets.) Set aside. Prepare the Dark Chocolate Base Dough, (see below) add the coffee extract along with the vanilla. While the dough is still streaky, remove the bowl from the mixer and scrape the paddle clean. Lightly flour a clean, flat work surface. Scrape the dough onto the floured surface. Lightly flour your hands and finish mixing the dough by using a gentle kneading motion, working until the dough is just blended. Do not overwork the dough, you want to be certain that all of the ingredients are just blended together. Using a wooden spoon, stir in the milk chocolate chunks when adding the base recipe’s semisweet chocolate chips to the dough, mixing until evenly distributed. You can also do this in the mixer, but heavy mixing tends to break up the chunks and chips and the baked cookies will have an undesirable dry texture. Using a tablespoon or small ice-cream scoop, make mounds of dough. Roll the dough into balls about 1-1/2 inches in diameter. Place the balls, about 2 inches apart, on the prepared baking sheets. Using your palm, gently flatten the top of each cookie slightly. When all of the cookies are formed, place in the open and bake for about 15 minutes, or until lightly browned around the edges. The center should be slightly soft to the touch. Remove from the oven and, using a metal spatula, transfer the cookies to wire racks to cool. Store, airtight, at room temperature for up to a week. This dough has a unique consistency, falling somewhere between a cookie and a cake in texture. 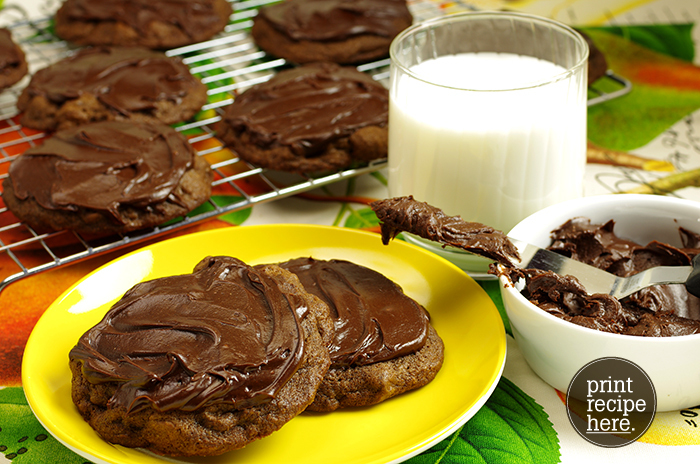 At Milk & Cookies Bakery, we use it for a wide variety of moist, rich cookies. If you are a chocolate lover like me, this cookie base will satisfy even the most intensely decadent, midnight chocoholic’s craving. Because of its richness, we use only the highest-quality dark cocoa powder and recommend that you do the same. If you want to take the finished cookies to the chocolate limit, ice them with the Chocolate Frosting (below). Heaven on Earth! Combine the flour, cocoa powder, baking soda, and salt in a mixing bowl. Set aside. Put the butter in the bowl of a standing electric mixer fitted with the paddle. Begin beating on low speed to soften. Increase the speed to medium and beat for about 3 minutes, or until light and creamy. With the motor running, gradually add the granulated sugar and then the brown sugar, beating until very light and creamy. Combine the eggs with the vanilla, add the egg mixture in two parts and beat to incorporate, scraping down the sides of the bowl with a rubber spatula after each addition. Gradually add the reserved dry ingredients, beating until just streaky. Remove the bowl from the mixer and scrape the paddle clean. Put the chocolate in the top of a double boiler over simmering water. Heat, stirring frequently, for about 4 minutes, or until the chocolate has melted. Remove from heat. Begin adding bits of butter, beating until the chocolate is smooth and shiny, and quickly whisk in the 1 tablespoon coffee. Put the confectioners’ sugar in a mixing bowl. Using a wooden spoon, stir the melted chocolate mixture into the sugar, beating until glossy. If the frosting is too thick, add more coffee, a bit at a time, to reach spreading consistency. Reprinted with permission from Milk & Cookies by Tina Casaceli. Copyright © 2011. Published by Chronicle Books, San Francisco, CA.